Montserrat is just under 1 hour from Barcelona by train, car or tour, Montserrat is a world class visitors attraction and a UNESCO World Heritage site. Montserrat monastery is also a location in bestselling author Dan Brown's new book 'Origin' released in October 2017 although it is only a short appearance to begin the book. The name Montserrat means 'serrated mountain' or 'jagged mountain. It is easy to see why this unusual and jagged mountain massif is named serrated mountain. Montserrat is one of Barcelona's and Spain's major tourist attractions because of its unique rock formations, the breathtaking scenery and panoramic views. The name Montserrat originates from the Romans, who called it Mons Serratus. It is also, but less frequently called 'Montsagrat' by the inhabitants of Catalonia, which means 'sacred mountain' in the Catalan language. Montserrat mountain is home to the Virgin of Montserrat who can be seen in the 'Santuari de La Mar de Déu' - the 'Sanctuary of Our Lady of Montserrat' Montserrat is also one of Spain's most famous Benedictine monasteries, the Monestir de Montserrat, which has a history spanning almost a thousand years. The boys choir sing two choral works in the Basilica at 1pm during the week. Tip: If you want a good seat in the spring, summer and fall to hear the boys choir, then it is a good idea to be inside the church by 12.30 latest. The boys choir do not sing on Saturdays and they do not sing on Spanish school holidays including summer holidays from end June to mid September. On Sunday the boys choir sings at 11.00 at mass service. Generally the Montserrat boys choir are away on tour twice a year. Visit the Montserrat visitors website for more information about Montserrat. If you want to see sunrises and sunsets, then book a room at the 3 star Hotel Abat Cisneros, next to the Basilica or book at the Montserrat apartments. There are trains from Barcelona to the base of Montserrat mountain where you can connect to a train that takes you up the mountainside to the monaster. You can buy combination train tickets to Montserrat Plaza Espanya station or at Barcelona tourist offices. A combination ticket includes train ticket to Monistrol de Montserrat from Espanya station in Barcelona, and the mountain rack-railway from the valley up the mountain to the monastery and funicular train tickets so that you can ride funicular trains from the monastery area and further up the mountain to enjoy the views. The train journey time is about 2 hours from Barcelona to Montserrat mountain. Montserrat is 61km west of Barcelona. Driving time is about 50 minutes depending on traffic. You can park very close to the Montserrat monastery. Or you can park at the free parking at the rack railway station or at the parking by the cable car station. The Sanctuary of Montserrat is a religious area and a public space. Kindly act and dress appropriately. - You may take photos inside the Basilica, provided you do so without flash and no services are being held. - At the Throne of Our Lady, it is best not to take photos, as it slows down the queue and disturbs others. - During acts of worship, we ask you not to enter the Basilica unless you wish to take part. Please wait until the services are finished. - The Tabernacle of Our Lady is closed during services to make it easier for the faithful to take part and attain an ambiance of silence and prayer. The Crypt, the Holy Chapel and the Tabernacle: these are places of worship. Please do not enter unless it is for devoting a few minutes of prayer and meditation. Aeri de Montserrat - Cable car to Monserrat Monastery. 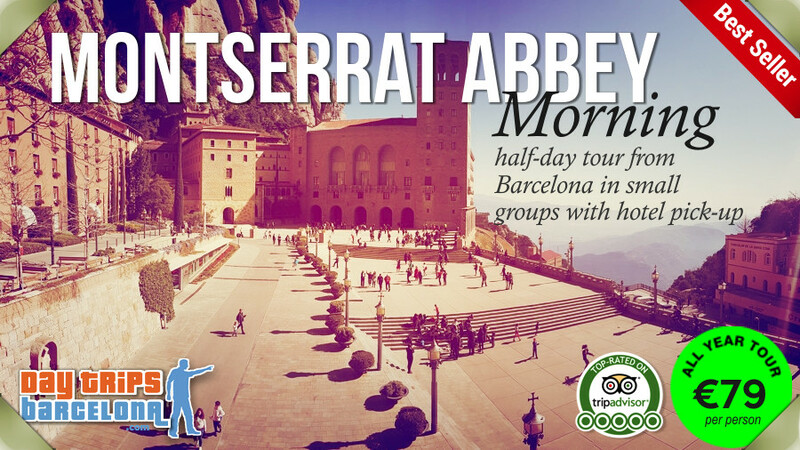 To take the cable car to Monastery take FGC train from Pl Espanya to station 'Monserrat Aeri' which is next to cable car station. The 'Aeri de Montserrat' cable car is usually open from 1st March to 31st October. Times: 09:40 to 14:00 and 14:35 to 19:00. Plenty of parking nearby.